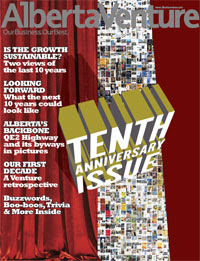 Alberta Venture, Alberta’s only province-wide business magazine, marks its 10th anniversary in April with a special issue that looks back at the first 10 years and forward to the province's next 10. As part of the special issue, publisher Ruth Kelly reflects on the challenges of starting a magazine that has grown to an audited circulation of 32,000 -- 25% paid and 75% largely qualified controlled -- with a claimed audience of 168,000. Over the decade, Venture Publishing has grown from a staff of five to more than 30, increased frequency to 12 times per year, added a contract publishing division producing six different magazines (Tracks& Treads, Food for Thought, Your Health, Grip, Open Mind and Alberta Innovators) as well as corporate magazines for clients such as Syncrude, Epcor and Nait. There is some predictable confusion and mild handwringing about the 2007 Print Measurement Bureau results. The Globe and Mail, for instance, writes a story that says the figures reflect the impact of the internet, which may be true, but is nowhere backed up in the story. Mastheadonline (sub req'd) makes some interesting comparisons of traditional rivalries. But sometimes it is worth taking the long view. We looked at the 2002 PMB data (when the average RPC was virtually the same as it is now -- 5.1) and selected out those (both English and French language) with the highest RPC figures, a measure of their "efficiency" in delivering those precious pairs of eyeballs. Then we looked at the same titles in the 2007 results. And we put any change in audience and RPC figures in percentage terms. These selected, high-performing magazines have seen their total audiences shrink by just over 12% since 2002, and their RPC figures have declined by 2.5%. Either by choice (not chasing after marginal, expensive readers) or by circumstance, Derniere Heure and Le Lundi have lost close to 30% of their audience, but their efficiency in delivering that audience has soared by almost 38%. On the other hand, since 2002, Outdoor Canada and Canadian Gardening have each lost 20% of their audiences and seen their RPC figure decline by 25% and 23% respectively. UPDATE: There are a lot of letters/comments to the Globe and Mail about the story on PMB. One writer corrected the Globe's misunderstanding that readership was calculated from reader-per-copy rather than the other way around. A lot of readers talked about the newspaper figures included in the PMB data. Some suggested that a reason why people are not reading is that there is too much advertising. Since all readers are subsidized by advertising (lest they pay $12 a copy for an issue) and most internet sites are subsidized by print advertising, there is a lot of confusion out there. Somehow, readers need to be disabused of the notion that anything is free, including online sites. They will either see their online sources cluttered with advertising (just like print) or they will have to subscribe (just like print) or they will have to pay the true cost of gathering and disseminating the information. The new Print Measurement Bureau (PMB) results for 2007 have been released, with data on total readership and reader-per-copy. The results are based on rolling two-year data for the period between October 2004 and September 2006. You can get the topline results here. We will burrow into them and comment later. A study by the Hill Strategies Group of Hamilton indicates that about 43% of Canadians read a magazine once a week in 2005. Canadian magazine readership -- in fact readership of all kinds -- is going up, apparently because there are more people. An article in the Globe and Mail reported that magazines and newspapers both saw a bump up in total readership over where they were 15 years ago. A similar phenomenon occurred with magazine readership. In 1992, 80.2 per cent of Canadians read at least one magazine that year; in 1998, the number was 77.2 per cent, then it rose to 78.2 per cent two years ago. But despite the lower rate of readership, the actual number of individuals who found themselves reading one or more magazines in 2005 was 20.4 million, up 3.2 million from 1992. Hill Strategies has made a name for itself by analyzing and drilling down into Statistics Canada data about the cultural field. The study, called A Profile of Cultural and Heritage Activities of Canadians in 2005 was funded by the Canada Council, the Department of Canadian Heritage and the Ontario Arts Council and is based on data gathered in the past 15 years by the General Social Surveys of Statscan. In 2005, 78.2% read at least one magazine, compared with 66.6% who read a book and 86.7% who read a newspaper, the study found. This is down slightly from 1992. But because of a 22.6% growth in the over-15 population, there was an increase of 3.2 million readers, or 18.7% between 1992 and 2005.
another 3.5% read a magazine one to four times during the year (920,000 Canadians). For those of you who wonder why anyone would want to read a magazine article or watch "Pirates of the Caribbean" on a teeny cell phone screen comes word that you've got plenty of company. According to a story published by the Centre for Media Research (Media Post), a new study has found that barely 5% of people access the internet from a mobile device -- even if their handheld is equipped for it. And only 1 in 5 access news or television on their devices. 50% of respondents to the study by Media-Screen say mobile internet access doesn't fit into their lifestyle. 58% have internet-equipped mobile devices that they don't bother to use. This has implications for the publishers out there who may be wondering how and where to allocate their time, budget and attention in multi-media applications. Although this study doesn't specifically address magazines, it appears that home and work screens are more likely -- at least for now -- to be the devices of choice for digital access to magazine content. The deadline looms for the Applied Arts magazine's Advertising and Design awards annual. Entry information can be obtained at the website. Deadline is May 4. Of particular interest to us are the categories related to editorial design. Entries are $65 each; a three-item series costs $95. The actual awards issue is published in November 2007 and this year, for the first time, there will be a gallery showing in Toronto, at a place yet to be announced, as well as the posting of the winning entries online. According to a story in mastheadonline (sub req'd) Rogers Publishing has rehired Christopher Loudon after firing him as editor of Hello! just two months ago. He is to be the new editor of Marketing, which has been without an editor since Stan Sutter was fired in January. Marketing has undergone a major revamp, with reduced frequency (every two weeks) and a redesign. Now, it has a new editor. Before Hello!, Loudon was editor of Inside Entertainment (Kontent) and TV Guide (Transcon). (His Canadian career started out as a research manager with Comac magazines in the '80s, after a time in New York with Reader's Digest. The National Magazine Awards, which has evolved over the past 30 years from a $50 a ticket, bun-tossing brawl where the presenter was paid with a case of Scotch into the slick and swish multi-media event it is now, is evolving still further. A few years back it moved form being a sit-down dinner to being a "grazing" experience from food stations in the Carlu, followed by an auditorium presentation of the awards themselves, Everybody paid the same. Now attendees are to be given three, differently priced options (tickets go on sale May 1) for the event which is held the evening of June 15. Reserved ten-seated round tables upfront in the Concert Hall ($1,350 per table or $135 per seat in advance, $1,500 per table after May 15) with the added benefit of being able to pre-order wine or champagne to enjoy during the awards ceremony. For $90 per ticket, individuals can reserve a seat in the Carlu’s 464-seat upper-level theatre overlooking the Concert Hall. Alcohol is not permitted in this section. Or for $75 per ticket, individuals can watch the awards ceremony on closed-circuit monitors from the Carlu’s elegant Round Room, where a cash bar will remain open during the gala. Flare, the Rogers fashion flagship, has announced the relaunch of Flare.com, its website. According to the magazine's press release, among the new features is a monthly celebrity 'Style Setter' spotlight, an interactive astrology section that allows users to find their perfect 'Love Match', a new Flash tool that allows readers to 'Get the Look' from actual Flare covers, two new blogs (The Lazy Fashionista and From the Runway) and interactive, photo style polls. Flare.com one of the earliest big magazine ventures onto the web,launched in 1996. The site is said to have an average of over 180,000 unique visitors and almost 1 million page views per month. A new quarterly men's magazine called Prelude is to debut in April. According to a story in Media in Canada, it's going to start off small, with 5,000 copies in Toronto, Ottawa, Halifax, Winnipeg, Calgary and Banff. The numbers will jump to about 20,000 for the June issue. Lucid Media co-owner and Prelude publisher Dean Jessop tells MiC distribution will eventually include Vancouver. "We will be national by fall, and I want to be in at least the northern part of the US by this time next year," he says. "By year two, we'll be at least bi-monthly, if not monthly." The magazine's media kit is available here. 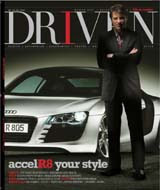 Driven magazine seems quite focussed on occupying the gap in the men's market left by Toro magazine. Within a month of the latter's demise, the magazine' editor, Michael LaFave, says it has expanded its circulation by 50%, including going controlled to more Globe and Mail customers (Toro, too, was carried by the Globe) and through Air Canada Maple Leaf lounges. In both instances, it moves into space previously occupied by Toro. According to a story in Media in Canada, the distribution is now 150,000, of which 130,000 are in the Globe, 10,000 with Air Canada and a 10,000 draw on newsstands. Time Inc. has announced that the venerable title LIFE will cease publication -- again -- effective April 20. There are many who have felt that the magazine, which had a glorious history as the pre-eminent picture magazine, had been suffering sort of a living death as a stripped-down newspaper supplement. Now, the name and image will only appear online as a photography portal and in certain branded books and collections. The only good news? That LIFE's enormous archive of 10 million images will be available online, free for private use. 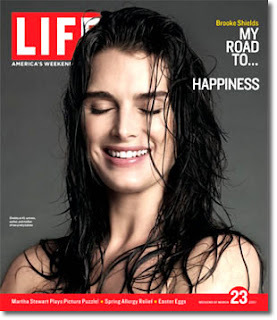 LIFE was re-launched as a newspaper supplement in 2004 and is carried in 103 newspapers with a total circulation of 13 million, the company said. "While consumers responded enthusiastically to LIFE, with the decline in the newspaper business, and the outlook for advertising growth in the newspaper supplement category, the response was not strong enough to warrant further investment in LIFE as a weekly newspaper supplement," Time Inc. said in a statement. LIFE, launched in 1936, was a weekly until 1972 when it went on hiatus and then re-appeared as a monthly, which also folded but then was revived as a supplement. The magazine had not been doing well financially, down 9.2% in advertising revenue and 21.3% in ad pages through February, according to the Publishers Information Bureau. "LIFE magazine was a truly innovative publishing venture. It was developed, edited and published by some of the best talent in the business and we can remain proud of its many achievements. But sometimes we have to make tough calls, and this was one," said Time Inc. Chairman, CEO Ann Moore in a statement. "Growth requires taking risks and the potential upside was huge, but unfortunately the timing worked against us. The market has moved dramatically since October 2004 and it is no longer appropriate to continue publication of LIFE as a newspaper supplement. However, Time Inc. remains committed to the LIFE brand, and we will now be concentrating on migrating this iconic brand in many innovative ways on multiple digital platforms." The company said LIFE "will continue with its plan to launch a major portal to put its entire collection of 10 million images online. The most important collection of imagery covering the events and the people of the 20th century will be made available to the public for personal use at no cost. More than 97% of this collection has never been seen by the public and contains the works of such master photographers as Alfred Eisenstaedt, Margaret Bourke-White and Gordon Parks, among others. LIFE's online site, to be launched later this year, will become the preeminent destination to view the most important photography of our time, both archival and contemporary." Labels: brands, closures, Life, Time Inc.
To compare Justin Trudeau to Paris Hilton is unfair--to Paris Hilton. "has a startlingly spare resume, and a political philosophy that can only be described as trite. That he would be seen as a great hope for the Liberal party is a mark of how much that party has lost since his father's era." Given the parlous history of its antecedents, Alberta Report and Western Report, there are many who would not have given very good odds of this magazine reaching its 3rd birthday. But here it is, and apparently prospering. Its Shotgun Blog is home to some of the rudest and most outrageous commenters anywhere. Its redesign has been slick and professional. And it resolutely pokes its finger in the eyes of everyone with whom it disagrees (and they are legion), particularly if the subjects are liberal, eastern or not sufficiently supportive of the Bushies. The publishers of the youth-oriented magazine The Magazine,have issued a press release that slams the Department of Canadian Heritage for denying it funding under the Canadian content rules of the Canada Magazine Fund. The release was signed by Eric Conroy, the magazine's publisher. [UPDATE: The press release has been given wider release through Canada News Wire. A story has been published by Mark Bonokoski of the Sun papers, a friend of the Conroy family, which quotes Nadia Laham and Scott Shortliffe of Canadian Heritage defending the rules. They do a pretty good job of it, too. The release, which was accompanied by tables showing the grants made to Rogers Media, Transcontinental Media and Quebecor for the past two years, is headed: Major publishers coin taxpayers money. Recently, our monthly youth title called THE MAGAZINE, was told that we did not qualify because our title only contained 73.5% “Canadian Editorial content” on average, and the cut off is 80%. Apart from the fact we don’t agree with their evaluation, there is no appeal process. The fund for this year has been divvied up and the big boys have taken most of the apples. New magazines aren’t allowed to apply. The question must be asked, “does Rogers need over 3.1 million dollars from taxpayers to fund their publications?” That’s what they’ve received over the past 2 years! Rogers and the others big players aren’t at fault here. It is the officials at Heritage Canada that need to take a ruler to their own “Canadian Editorial” evaluation process, instead of just filling the trough for the largest porkers to feast. The Magazine has developed an unusual marketing plan that involves selling through Safeway, Dominion and Sobey's stores, with the hook that part of the cover price goes to support things like the Kids Help Line. In addition, the magazine announced a couple of months ago that 25% of the value of subscriptions purchased through the Canadian Automobile Asssociation would go to support school safety patrol programs. According to the Department of Canadian Heritage website, The Magazine received $44,000 in 2006 for content development. 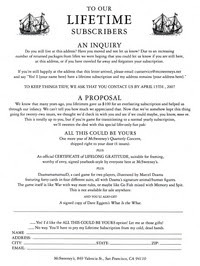 The press release has been issued since the magazine was notified that it was denied funding in the current round. The press release tables indicated that in the two years 2004-2006 Rogers titles received $3,148,718, Transcontinental titles received $2,468,545 and Quebecor titles $1,863,091. Nomination time looms for the Canadian Newsstand Awards which are held each year as part of Magazines University. Deadline is April 12. Nominees will later be named in six categories plus best new magazine for titles launched in 2005 and 2006. Winners will be announced June 5 at the Old Mill Inn and Spa. They did what? Do you have a name? Ed2010 is an organization we've mentioned before. It's based in New York, but has chapters in many cities across North America, including Toronto. Its intended for young editors who want to make it into top editing positions in the industry. It tends to attract more young women in the business than young men, although that's not the intention. They get together from time to time for "happy hour" swaps of gossip and tips on jobs and other opportunities. Sort of peer mentoring. The main website carries some interesting advice on job hunting, interview skills and early warning about so-called "whisper" jobs, which are rarely advertised. The Toronto chapter has a new coordinator, Corinna VanGerwen, a senior editor at Style at Home, who can be reached at toronto@ed2010.com. The next Toronto event will be Monday, April 16th, from 6:30 pm on, in The Conservatory (second floor) at The Duke of York, 39 Prince Arthur Ave. (near the Bedford Rd. exit of the St. George subway station). Guardian editor Alan Rusbridger told the Changing Media Summit in Britain that it is "impossible to predict on what technology platform journalism will be delivered in five years' time or even a year. "This, according to a story in the U.K Press Gazette. Rusbridger has been an outspoken advocate of taking advantage of technology and opportunity, hence his company's launching of a series of very robust websites, plus a new monthly international magazine. He predicted that readers will provide more and more content. "We are grappling with this balance of what goes on to the website and what goes in the paper. A great part of that web[content] will be generated by users in time." But he added: "The role of journalists in this multi-media age has not changed and that user-generated content will only be a compliment to their work. "There is still a role for people to find things out. But to have people sat in a newsroom in Wapping or Farringdon Road thinking they know everything is barmy. "The smart journalists are working out ways of using that [user generated content]." There's a feature story by freelancer and Ryerson journalism instructor Alex Gillis about cheating on campuses and his own experiences dealing with it. There's another interesting feature by Anita Lahey about the amazing Boris Castel, nuclear physicist and editor of Queen's Quarterly. *Disclosure: I do some occasional research work (not editorial) for the magazine. 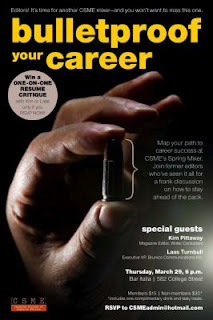 When it comes to providing guidance to aspiring freelance writers, some magazines aren't really very helpful. There doesn't seem to be a pattern; although the bigger they are, the less likely they are to provide such guidance, it's not an ironclad rule. Titles like Canadian Business or Maclean's or Canadian Art or the U of T magazine or Outpost, don't have any discernible writers' guidelines, at least online. Others, like Western Living, say essentially "Just read our magazine and talk to us". Still others, like This Magazine and Prairie Fire and Up Here and Fuse and Geist go into some detail about what they're looking for and why. If you are a writer and would like to submit a proposal, submissions can be sent to originals@rd.com or mailed to 1100 René Lévesque Blvd. West, Montreal, QC H3B 5H5. We are looking for dramatic narratives, inspirational stories, articles about crime, adventure, travel and health issues. If we are interested in pursuing your idea, an editor will contact you. Many publications still require typed or printed copies of manuscripts and stamped, self-addressed envelopes for returning manuscripts. In a digital age when memory and bandwidth are so cheap, it seems odd that many smaller literary and cultural magazines continue this buggy-whip practice. Perhaps it is because many of their contributing poets and short story writers are old-fashioned, but somehow we doubt that. It seems curious that magazines of any size wouldn't make it clear and easy to understand what they want, and what they don't. Perhaps they are are inundated by submissions already, or mostly receive stuff of dubious quality from hopeless hopefuls. Perhaps they don't use much freelance stuff, which makes it understandable that they don't want to invite material they'll never be able to use. But howcum magazines that accept freelance pitches don't all have readily accessible writers' guidelines? You can get a lot of understanding about a magazine's vision and enterprise by reading these guidelines, even if you're not intending to submit work to them. Here's a short list of writers' guidelines provided online by a miscellany of magazines from coast to coast to coast. We'd be interested to hear from editors, about how they feel about specifying their needs this way, and from writers, who need to know what's wanted, before they can deliver it. We don't often get to see the U.S. edition of Time, unless it's in transit at a U.S. airport, but the magazine has undergone a much-publicized redesign, which was unveiled last Friday. 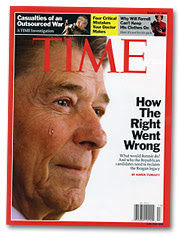 The cover subject was a brief flash of controversy because it showed Ronald Reagan with a phony tear trickling down his cheek (we thought the idea was so crashingly, obviously an illustration that we wondered why anyone got upset). Anway, Advertising Age asked a bunch of other magazine editors to comment on the new look. Most of what they said was more or less complimentary. The Canadian Society of Magazine Editors (CSME) holds occasional "mixers" in Toronto with special guests. The mixer is called, rather ominously, Bulletproof your career and is appropriately illustrated (see above left). Apparently, the reality of the matter is less ominous, more about "staying ahead of the pack" than any actual mayhem. Lucky participants who respond early may get a one-on-one critique of their resumes from the guests. Everybody else, we suppose, will just drink and schmooze. It's $15 for CSME members and $30 to non-members; entry includes nibbles and one free drink. One of the things that distinguishes the new MagNet magazine conference from Magazines University, is its bilingual nature. MagNet has now posted a full French language version of its website. A study carried out in the U.S. suggests that magazine ads and content are big influencers when it comes to motivating consumers to make an online search. A story from the Centre for Media Research says BIGresearch's Simultaneous Media Survey found that 47.2% of consumers were motivated to conduct an online search after looking at magazine ads and 43.7% after reading articles. Mike Gatti, Executive Director of the Retail Marketing and Advertising Association, said "...While search engine marketing continues to be a popular strategy, retailers should not lose sight of traditional advertising channels to promote products and services." Canada Wide to launch "sustainable"
The Vancouver city magazine field may become a bit more competitive with the proposed May launch of a quarterly called Granville by Canada Wide Media. According to a story in the Vancouver Sun, the magazine will focus on "sustainability". The magazine takes its name from Granville Island and Granville Street, the market and shopping area in the heart of Vancouver. Canada Wide representative Samantha Legge said every story will bring sustainability to the foreground and give readers the tools to make informed decisions. Regular sections will cover local food, fashion and homes, while in-depth features will research issues like housing, transportation and energy options. "It will be a city magazine, first and foremost, but everything will have a sustainable element to it," Legge said in an interview. "So if we write about a restaurant, we'll feature one that engages in sustainable practices." Canada Wide Media publishes about 40 titles, including TV Week, BC Business, Garden Wise and Pacific Golf and is the largest consumer publisher in Western Canada. The new magazine will itself be fairly green, being published on recycled paper. According to Mastheadonline (sub req'd) Granville will have an initial circulation of 25,000 and will charge $3,400 for a full page, 4-colour ad. The two principal city magazines in Vancouver already are Vancouver Magazine (Transcon) and VLM (Vancouver Lifestyle Magazine -- an independent), although The Georgia Straight weekly could be included in that category. What about the (cultural) workers? The Professional Writers Association of Canada has expressed disappointment today about the absence of measures to assist cultural workers in the federal budget. PWAC said that, after sharing with the Department of Canadian Heritage and the Ministry of Labour "the disquieting results" of research showing a steady erosion of writers' incomes in the past 5 years, they had hoped for more, paritcularly tax incentives for the creation of Canadian written content. As a representative of small business owners, PWAC acknowledges potential benefits to our members from new provincial transfers, the capital cost allowance and increased funding for skills training, but remains disappointed that the importance of cultural workers to the overall economy is not addressed. “What's really missing from this budget,” former PWAC President Tracey Arial notes, “is a recognition that self-employed creators are important knowledge economy workers. Cultural sector investment pays this country back at an incredible rate of return, yet professional creators remain economically threatened." A tidy little chapbook entitled The Taddle Creek Guidebook to Fact-Checking Fiction has come into my hands, from the publishers of the estimable literary magazine. It addresses the issue of spelling names right and describing locations accurately in short stories and the like, the better to involve the readers (who are quite likely to notice such errors). Inside Higher Ed reports an interesting twist emerging from university rankings, which have long been important to Maclean's and long been a bone of contention for Canadian universities. In Crow’s case, he would be paid an extra $10,000 for each of 10 goals he achieves and would get an extra $50,000 if he achieves all of them. Nine of the goals relate to actions on which the university is the key actor (goals such as increasing the diversity of freshmen, improving freshman retention, adding to research expenditures, improving faculty salaries, etc.). There is one goal over which the university has no direct control — an improved U.S. News ranking. If Crow achieves the other nine only, he would miss a shot at $50,000 in addition to the reward for the higher ranking. Not just in Canada, you say? With the collapse of the Weekly Scoop by Torstar and the summary dismissal of the Canadian staff of Hello! magazine by Rogers, observers could be forgiven for thinking that Canadians just can't get this celebrity publishing thing right. When asked which titles did the worst job, Star (31.8%), In Touch (22.7%) and Life & Style (19.7%) were all included. Transcontinental Media says that 70,000 subscribers have already signed up for the Canadian edition of More. This, according to a story in Media in Canada. The magazine, aimed at mature women, is being launched on Wednesday with a big party in Toronto's distillery district and will debut March 26 with a guaranteed first-issue circulation of 120,000. There will be six issues of the Canadian More in 2007 and eight are scheduled for 2008. The editor is Linda Lewis, the former editor of Today's Parent magazine. A lot of the promotion of the magazine has hinged upon using Transcontinental's online databases and freestanding inserts in the other Transcontinental titles as well as major urban newspapers including the Globe and Mail, Ottawa Citizen, Calgary Herald, Victoria Times and Toronto Star. The first issue is to sell for $1.99 on the newsstands. More's premiere issue includes a "Top 40 Over 40" feature spotlighting a spectrum of Canadian women ranging from Governor General Michaelle Jean to actor Pamela Anderson. The magazine will launch the "More 40+ Model Search," a competition targeting women in their 40s and 50s. The winner will receive a one-year contract with Toronto-HQ'd Elite Model Management, a fashion layout in More's April 2008 issue, plus over $4,000 in prizes from sponsors. The contest will run for a full year with promos in the spring, summer and September 2007 issues of the magazine. Shelley Middlebrook, who was let go in January as Publisher of Rogers's Hello! (Canada), along with most of the Canadian staff, has now been appointed Vice-president and Publisher of Kontent Publishing's Inside Entertainment. Previous to Hello! she had been in sales for the CBC and before that was Publisher of Brunico's entertainment industry magazine Playback. Green living is all the rage; now, perhaps, so is green dying. An item in the Almanac department of the current (April) issue of Harrowsmith Country Life, from Malcolm Publishing, explores the issues and benefits of "natural" burial, without all of the extraneous (and expensive) trappings pushed by the traditional funeral industry. It talks about how you can be put six feet under in an eco-friendly way. For instance, it makes the case against cremation, which uses fossil fuels and generates pollutants. Apparently finding starting a city magazine in Montreal alongside its existing quarterly to be biting off more than it could chew, Maisonneuve has announced that it is abandoning the idea. You're receiving this email because you've expressed an interest in contributing to Maisonneuve's city magazine project. This is the official announcement that we are not proceeding with the city magazine at the present time. Although we had raised considerable funds, the Maisonneuve team has decided that we do not currently have the capacity to continue with the project. The prospect of many more months of fundraising, set-up costs, legal and accounting details, and the thousand other large and small tasks essential to creating a successful startup business - all before even reaching the actual launch date - made this too large a project to be managed on our present financial and human resources. There is no doubt now about where our priorities lie: in Maisonneuve, which will continue as the quarterly publication you've grown to know and love. The little magazine that could chugs on, evolving with every revolution. Ours is one of the best arts, culture, and society magazines in Canada - and it is only growing stronger and stronger. We're also continuing to develop our online presence, which includes maintaining a strong, engaging web site chock-full of original content. We thank you for your interest in Maisonneuve's endeavours, and encourage you to submit your fiction, non-fiction, and story pitches to Maisonneuve magazine and Maisonneuve online. You can check out our submission guidelines here, and direct your work to submissions@maisonneuve.org. Maisonneuve started in 2002 and for a time was 6 times a year; Webster announced a few months ago that the magazine was being cut back to a quarterly, preparatory to the launch this spring of a Montreal city magazine, the first that had been published there in many years. Its name had yet to be announced, or whether it was to be bilingual. The guidelines for prospective writers and artists said the magazine "will offer a fresh, new perspective on our hometown. We'll be starting from scratch and thinking big. Subjects to be covered include (but are not limited to): art, travel, politics, business, film, shopping, theatre, music, architecture, real estate, restaurant culture and nightlife." The Web has become an archipelago of tiny villages tied together not by proximity but by interests. In the old-style town square, passionate, informed people came together to debate and share news and create dialogue. Today the Web is that square. Traditional media have lost their monopoly on journalism, most people agree. And more and more, everyday citizens will be plying the trade -- once they find the village they want to be part of. So, if you're wondering how, or if, you should be finding ways to involve your readers in your magazine, beyond being passive consumers, now's apparently the time to start. Toronto Life's purpose-built website to cover the Conrad Black trial like the dew has now, today, gone live. You may reach it here. "Accountability" and "ROI" have been words or phrases buzzing around the magazine advertising business for some time, though nobody was quite sure how measuring the effectiveness of magazine advertising would be accomplished. 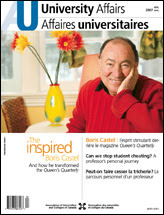 Magazines Canada, in cooperation with Starch Research, is trying to remedy that. They have luanched a new program called magWorks that will allow advertisers to better understand ad effectiveness, their own ads and those of their competitors. An online survey methodology checks out overall ad impact, communication value, visual focal points, purchase intent and more. But it does it at a relatively modest price -- as little as $1,200 per ad -- because costs are shared by the subscribers. Omnibus survey results are also available to subscribers on a category basis. "magWorks is about helping magazine advertisers succeed," says Gary Garland, Magazines Canada's Executive Director of Advertising Services. "We want to help advertisers wring every last percentage of performance from every ad so that they achieve maximum results from their magazine buy." "Few advertisers regularly test magazine creative. However, our experience in creative testing has taught us that we can help advertisers and their agencies improve their magazine communication," adds Brian Hickey, President, Starch Research. "magWorks helps to strengthen that all-important connection between advertiser and consumer." Details about magWorks may be found at http://www.magworks.ca/. For additional information, please contact Brian Hickey at Starch Research, brian.hickey@starchresearch.com or Gary Garland at Magazines Canada, ggarland@magazinescanada.ca. It manages to print some colour, but mostly black and white inside. Its tagline is Strong words for a polite nation, which pretty much sets the tone. It could best be described as "unafraid" and as a result has some interesting surprises. A casual reader could be lulled by its rather restrained and careful design, but will be smacked back to reality by the illustrations, which are a highlight, some in colour, many b&w and the essays. Issue 45 also has a nice essay on marbles (the playing of). The magazine (or journal, as it calls itself), seems like a miscellany, but with a guiding philosophy. "The discovery, nurturing, and promotion of new and established Canadian literary talent." Which pretty much sums up what subTerrain seems to do, too. A sub is $25 for 6 issues, ($20 in a 'special offer' in the most recent issue); a single copy is $5.95. You can buy it at many better newsstands or through Magazines Canada's online sub service. There's a seminar in Toronto on March 21 for people in magazines who care about the environment (which we take to be all of you). March 21 from 9 to 11:30 a.m., the session will explore the environmental options avaialable to magazines. "We can't tell you how much we appreciated that. Now that we've somehow kept this thing going for twenty-two issues, we thought that we'd check in with you and see if we could maybe, you know, move on." Apparently what they propose is to extend the sub for another year and send a certificate of "lifelong gratitude" and a couple of premiums, including a copy of Eggers's most recent book. An annual 4-issue sub to McSweeney's, an eccentric publication that is more a book than a magazine, costs US$55. Interesting review of Tyler Brule's much-talked-about Monocle magazine by Dylan Stableford, the managing editor of Media Bistro. That Monocle doesn't smack of desperation is admirable. But there's no way anyone who doesn't have patience for a high-end literary journal's gonna read it. Last month, Tribute Entertainment Media Group suffered an (expected) setback when its Tribute in-theatre magazine was bounced from a bunch of cinemas in favour of Famous magazine in the wake of the Cineplex takeover of Famous Players. This month, Tribute was able to announce a significant bounce-back by signing a deal to put a new title into 13,000 cinemas in the U.S. controlled by National CineMedia Inc. According to a story in the National Post, the deal has been two years in the making, beginning when Brian Stewart, the head of Tribute approached Regal Entertainment, part of National CineMedia, with the idea. The American company decided to put it out for proposals to other big players like Time Warner Inc., Conde Nast Publications Inc. and Hachette Filipacchi Media U.S., which published Premiere magazine.but, ultimately, went with Tribute. As Stewart says, "We were a pioneer in in-theatre exploitation." U.S. movie theatres have not previously gone with dedicated in-theatre magazines, distributing instead traditional newsstand titles like Premiere and Entertainment Weekly to their customers. Tribute's deal comes in the wake of the announced closure of Premiere. Tribute has a circulation of about 500,000 in Canada. The company publishes four other magazines -- Kids Tribute, Teen Tribute, En Primeur and En Primeur Jeunesse -- and operates a Web site, www.tribute.ca, that receives 1.1 million hits a month. Application Deadline: Before March 27th. Note that there are a limited number of assignments available, and we may fill all of them before that date. Corus Entertainment is a multimedia and specialty television company with brands that include YTV, Treehouse, W Network, Movie Central, Nelvana, Kids Can Press and radio stations including CKNW, CKOI and Q107. 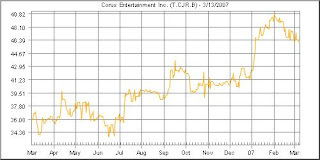 It had consolidated net revenues for the year ended August 31, 2006 of $726.3 million, up 6% from $683.1 million in 2005. Net income (profit) for the year was $35.5 million compared to $71.1 million ($1.66 basic and $1.65 diluted earnings per share) in 2005. We don't know how much money the company is making on its websites (if anything) since this is not broken out. What we do know is that the overall share price of the company is up about 30% in the past year. Since 1989, when Toronto-born Bonnie Fuller [ex-Flare and Toronto Star] emigrated to the U.S. to edit YM, she has grasped the U.S. magazine marketplace brilliantly in producing newsstand gains there and subsequently at Marie Claire, Cosmpolitan, Glamour, US Weekly and, since July 2003, as American Media editorial director. (Star's performance has been mixed.) So, when she wrote her autobiographical The Joys of Much Too Much last spring with all of her career controversies and gossip disclosed, we thought for sure (May 1, 2006) that the her April 10 Maclean's cover would outsell anything back home. Wrong. Bonnie's cover fared worst and that of then-new Prime Minister Stephen Harper fared best. Quite an unexpected star was born. Major magazine makeovers don't make as big a difference as their publishers may think, according to a story in MediaDaily News. Writer Eric Sass, whose hook is the forthcoming March 26 launch of the revamped Time magazine, looks at the past five years of visual or structural renovations at major titles and says that the results are "minimal, at best", at least in terms of success in the marketplace. He places a lot of emphasis on single copy sales and illustrates his thesis with ABC FAS-FAX data. The redesign has taken place in the shadow of the second half of 2006, in which Time's newsstand sales in the U.S. shrank by 8.3%. 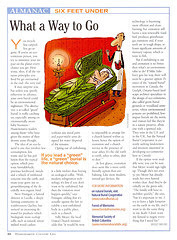 Acknowledging the reality of shrinking paid circulation, in January, Time began offering advertisers the choice of buying space using a much-reduced rate base of 3.25 million--down from 4 million--or a "total audience" figure of 19.5 million per issue, based on figures from Mediamark Research Inc.'s (MRI) new issue accumulation study. However, the choice between these rate models is unlikely to distract from the decline at the newsstand--and if other recent magazine redesigns are any indication, Time's new look won't be much help there, either. Sports Illustrated -- Editor Terry McDonell in 2002, faced with competition from the newly launched ESPN Magazine, made SI younger and hipper, including shorter, more opinionated articles. "But the redesign did not produce a lasting increase in readership or ad pages. Aside from an 8.1% increase in ad pages from 2003-2004, SI has experienced three years of declines--including a disastrous 16.8% drop in 2004-2005, and a more modest 3.5% drop in 2005-2006." Parenting -- which Time Inc. recently sold -- ws redesigned by Editor in Chief Janet Chann in May 2003. The magazine was repositioned to target women more exclusivelyand its redesign won it the 2003 National Magazine Award for General Excellence, among other honors. There was 12.2% growth in ad pages from 2003-2004 to end at 1,468. "But as with SI, in the long run the redesign did not shift Parenting's fortunes substantially: Growth slowed in 2004-2005, with a 4.5% increase in ad pages to 1,533--and then crashed in 2005-2006, with ad pages plummeting an alarming 20.1% to 1,225. ABC recorded fairly consistent declines in newsstand sales and paid circulation. Average newsstand sales sank 65%--from 66,440 in June 2003 to 23,342 in December 2006--as total paid circulation declined 10% from 2,088,162 to 1,877,421. The title's weak performance was doubtless a factor in Time Inc.'s decision to sell the Time4Media group of titles." Field & Stream -- Also sold this year, it was redesigned in May 2003, increasing the physical dimensions of the magazine by half an inch, while introducing new departments and a new graphic design concept. "However, aside from a short-term bump, the redesign failed to produce long-term gains by ABC and PIB measures. Ad pages did indeed rise 9.8% in 2003-2004--but this was followed by a 4.8% drop in 2004-2005 and a 13.3% drop in 2005-2006, for a decade low of 605. In that time, newsstand sales and total paid circulation have remained stagnant." A pair of makeup artists and the Star Media group have partnered on a new, free monthly beauty, wellness and anti-aging publication called simply B Magazine, according to a story in Media in Canada. It launched last Friday with a primary target of women aged 25-55. The magazine's co-editors, Jayne Hobbs and Maddy Dennett, were founders and directors of the Canadian Network of Make-up Artists. 50,000 copies were distributed via Dreamboxes, Metro boxes and Gateway Newsstands. The mag will also be in selected salons and spas. The magazine will cover beauty (skincare, makeup, hair and nail care, salon and spa, and style and image); anti-aging (cosmetics, injectables, laser treatment, medical clinics, prescribed skincare, and paramedical services); and wellness (nutrition, health and lifestyle, fitness, and travel). Canadian Geographic getting out of the merchandising business? Canadian Geographic has always been among the leaders in Canadian consumer publishing in terms of developing line extensions and exploiting their hard-earned brand. 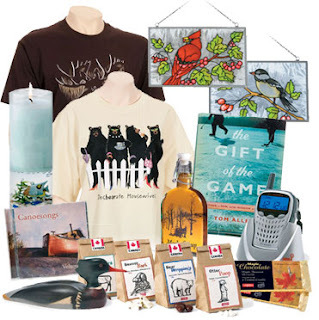 One of the areas in which they showed such leadership was in merchandising, selling everything from maple butter to telescopes and branded T-shirts. That is coming to an end, apparently, with a giant "inventory blowout" on the merchandising site which seems to confirm rumours that CG is shutting down this division. It's not known if this means that the CG "store" will disappear entirely or merely shrink back. But when you're selling your stuff at 25% to 75% off, its pretty clear it's not business as usual. There was also some talk a while ago that CG would be launching a digital edition. That is apparently on the shelf now. Perhaps one of those shelves that are emptying at deep discount prices. The Toronto Star, which has had a spotty record when it comes to success in magazine publishing, has just announced the launch of a new title aimed at the south Asian community in the Greater Toronto area. It's called Desi Life, (pron. They-see). Shown at right is a partial view of the first cover, out in April. "Desi Life magazine will showcase movers and shakers in the South Asian community, with regular features on trends in Canada and on the subcontinent,the latest on Bollywood and Tamil cinema, cricket, food, fashion, the arts,and much more," said Bageshree (Shree) Paradkar, editor (shown, left). The Star's publisher, Jagoda Pike, referred to this kind of venture as "culturally specific content", that is intended to attract south Asian readers and serve advertisers who want to reach them. 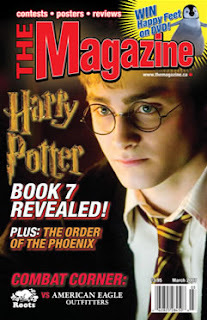 The magazine says it will have a total circulation of 65,000 and will publish 5 times in 2007 (first issue is April 19). A full page ad will be $7,192 or about a $110 CPM based on circ. It will be available through various (unspecified) retail outlets and through targetted distribution with The Star in pockets of Toronto with large, south Asian populations. The new magazine will be up against some established competitors like Anokhi and even Blink. Call it the law of unintended consequences. Many major consumer magazines, including the likes of Canadian Living, Homemaker's, Flare and so on depend on impulse purchases at the supermarket checkout for a good part of their newsstand sales. A speaker at a Magazine Publishers of America conference, reported in Folio:, says that self-checkouts threaten to cut into these sales. Michael Porché, CEO of Distribution Services Inc. told the Magazine Publishers of America Retail Conference in Orlando that there is a 40 per cent decrease in magazine sales among the 27% of shoppers who use self-checkouts. Porché said magazines have to make the case for magazines at all checkouts. Longtime magazine writer and activist, June Callwood, has been given the Writers' Trust Award for Outstanding Contribution. Callwood, 82, wrote for Maclean's, the Star Weekly and was one of the 11 founders of what was then the Periodical (now Professional) Writers Association of Canada in 1976. If any of you happens to see an injustice, you are no longer a spectator, you are a participant and you have an obligation to do something. 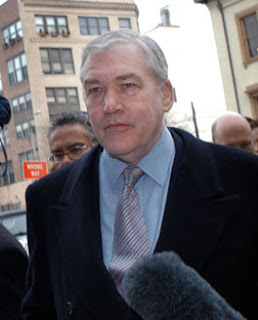 Frank magazine cleverly hornswoggled Conrad Black and a good part of the media by keeping a hoax website supportlordblack up and running and making news for more than a month. It revealed its prank in the current issue (sub req'd to read online). According to Patricia Best's column in the Globe and Mail, the Globe was one outlet which was taken in; others were New York magazine, the National Post, the Toronto Star, Canadian Business and Editor and Publisher (which confesses how it was duped in a lengthy article). "I am again flattered by such a thing. I will give you all CONRAD WILL WIN shirts when you are here."